Be the first to share your favorite memory, photo or story of Della. This memorial page is dedicated for family, friends and future generations to celebrate the life of their loved one. 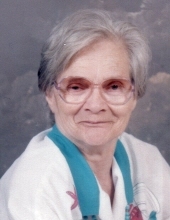 Della Mae Kessler Moody, 94 years of age of Grundy, VA, passed away Saturday, March 23, 2019 at Heritage Hall in Grundy, VA. Born January 27, 1925 in Roanoke, VA, she was the daughter of the late Luther Herman Kessler and Mary “Mollie” Virginia Davis Kessler. Della was a member of Harman Holiness Church and Grundy Senior Citizens. A loving mother, and grandmother. In addition to her parents, she was preceded in death by her husband Beacher Allen Moody, daughter Mary Alice Carter, son Larry Charles Moody, seven sisters and eight brothers. Survivors include her daughter Donna Marie Linton of Maxie, VA; son Phillip Allen Moody and wife Lynn of FL; son-in-law Alan Carter of Grundy, VA; ten grandchildren, fifteen great-grandchildren, four great-great grandchildren, several nieces, nephews and friends. Funeral service for Della Mae Kessler Moody will be held at the Shortridge-Ramey Funeral Home Chapel in Grundy, VA, Wednesday, March 27, 2019 at 12:00 noon with Pastor Danny Hess and Reverend Randolph Sesco officiating. Burial will follow in the Mountain Valley Memorial Park, Big Rock, Virginia. Active pallbearers will be John Linton, Jason Linton, Bobby Linton, Philip Yates, Ronnie Carter and Freddy Stiltner. The family will receive friends at the Shortridge-Ramey Funeral Home Chapel, Tuesday, after 6:00 p.m. with evening service to be held at 7:00 p.m. The family of Della Mae Kessler Moody have entrusted the care of their loved one to Shortridge-Ramey Funeral Home of Grundy, VA.
"Email Address" would like to share the life celebration of Della Mae Kessler Moody. Click on the "link" to go to share a favorite memory or leave a condolence message for the family.